In November 2013, Robert Bosch GmbH and the Japanese companies GS Yuasa International Ltd., based in Kyoto, and Mitsubishi Corporation, based in Tokyo, set up a joint venture. Known as Lithium Energy and Power GmbH & Co. KG, the new company will be headquartered in Stuttgart. It will develop next-generation lithium-ion battery technology. This next generation is needed in order to make the electric vehicle a successful mass product in the next decade. “In setting up this joint venture, we want to achieve nothing less than a giant leap forward in the development of battery technology. Our aim is to make lithium-ion batteries twice as efficient,” says Dr. Volkmar Denner, who, as chairman of the board of management of Robert Bosch GmbH, is responsible for research and development. For electric vehicles, more efficient batteries will mean greater range. For consumers, the car will also be more affordable, since the rechargeable batteries can be smaller. Robert Bosch GmbH and its partners are confident that electromobilty will become a mass market from 2020 onward. Electromobility is an important step toward making mobility climate-friendly and sustainable. 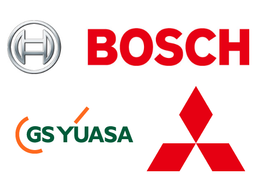 Bosch holds a 50 percent stake in Lithium Energy and Power GmbH & Co. KG, with GS Yuasa International Ltd. and Mitsubishi Corporation each holding 25 percent. The composition of the board of management reflects these shareholdings. Its members are Dr. Rolf Speicher from Robert Bosch GmbH, Toshio Ohara from GS Yuasa International Ltd., and Yutaka Kashiwagi from Mitsubishi Corporation. They will initially head up a team of some 70 associates in Germany and Japan. Bosch will support these joint activities with its entire portfolio of components for electromobility. With its competence in the area of battery packs and battery management systems, Bosch specializes in the monitoring and control of cells and complete systems, as well as in integrating them into vehicles. In addition, it will contribute its know-how in production processes and quality management relating to the large-scale series production of complex products. GS Yuasa will contribute its many years of experience in manufacturing lithium-ion battery cells whose high density makes for a longer range, as well as its expertise in materials systems and electrochemistry. As an established manufacturer of automotive and non-automotive lithium-ion battery cells, GS Yuasa has a strong engineering team and modern production lines with a high level of automation. Mitsubishi Corporation will contribute its global sales network and experience as an integrated global business enterprise. In addition, Mitsubishi will use its strengths in the establishment of global value-added chains – which include raw materials, semi-finished products, and marketing – to take the joint venture forward.